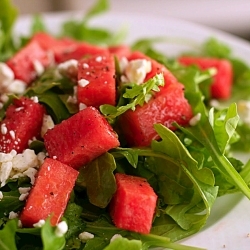 A light and delicious salad for this hot summer weekend- courtesy of skinnytaste. Wash arugula and dry well. In a large bowl whisk vinegar, olive oil, salt and pepper. Toss with the remaining ingredients and serve.